Cole Sorensen, of Reno, Nev., throws down on his way to a first-place finish at North Tahoe Series Rail Jam 3 on Sunday, Jan. 14 at Boreal Mountain Resort. 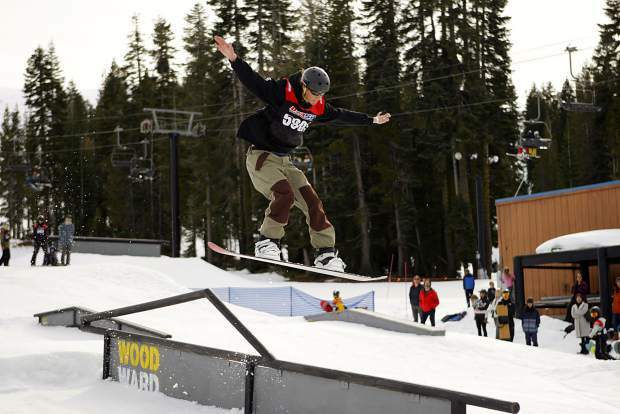 While the Truckee-Tahoe area awaits the first significant snowstorm of 2018, riders and skiers at Boreal Mountain Resort made the best of the conditions by heading to the park for the United States of America Snowboard and Freeski Association North Tahoe Series’ Rail Jam. Roughly 50 competitors took on a trio of upper and lower features near the bottom of the park on Sunday, Jan. 14, competing in a jam-style format, which allowed for the skiers and snowboarders to get in as many runs as possible within the session’s allotted time. The result would be 30 minutes of leg-burning action as the competitors hit the two features, unstrapped, and hustled back to the top for another opportunity to score. Several locals had impressive showings during the day’s riding. Truckee’s Marea Adams picked up her first win in rail jam this season behind a smooth frontside 270 on the middle set of features to rack up 1,030 points and cruise to victory in the women’s 14-and-over division by a 110-point margin. Other local winners in freeski included Truckee skiers Sawyer Coll, who scored 1,090 points for first place in the boys’ 10-13 division, and Mack Winterberger with 1,050 points for first in the boys’ 9-and-under division. Elisa Paquier, of Saratoga, Calif., won the girls’ 10-13 division, and Mathew Ruiter, of Rocklin, Calif., won the boy’s 14-and-over division. Local riders wouldn’t find as much success in the afternoon’s snowboarding heat where competitors from Reno, Rocklin, San Francisco, and South Lake impressed the judges enough to capture wins. “It’s all good,” said Reno snowboarder Ella Sorensen on her day of competing. Sorensen stacked up 1,050 points to take her second rail jam win of the season, and made the most out of some of the smaller features to win the girls’ 10-13 division. Truckee’s Elena Schipani was second with 940 points. Also capturing a second victory this season was South Tahoe’s Kaitlyn Bland, who tallied 1,020 points to win the girls’ 14-and-over division. On the boy’s side, Noah Brown, of San Francisco, took the win in the day’s biggest field of competitors, defeating 11 other snowboarders to claim the title out of the boys’ 10-13 division. Brown hit several features during the 30 minutes, showing off a buttery style on the boxes and tube to pick up 1,110 points and the win. Cole Sorensen, of Reno, stuck with the most difficult features during his run, flying onto a bench before throwing a trick onto the rail to win the boys’ 14-and-over class. He finished his day with 1,040 points for his second rail jam win of the season. Sunday’s rail jam served as the second competition of the series. Rail Jam 2 was scheduled for Jan. 6, but was postponed due to conditions. The race has bee rescheduled for Saturday, Jan. 20, at Northstar California Resort.